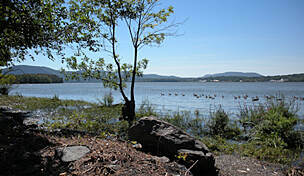 Located in the mid-Hudson Valley is a remarkable trail that is picturesque and family friendly. 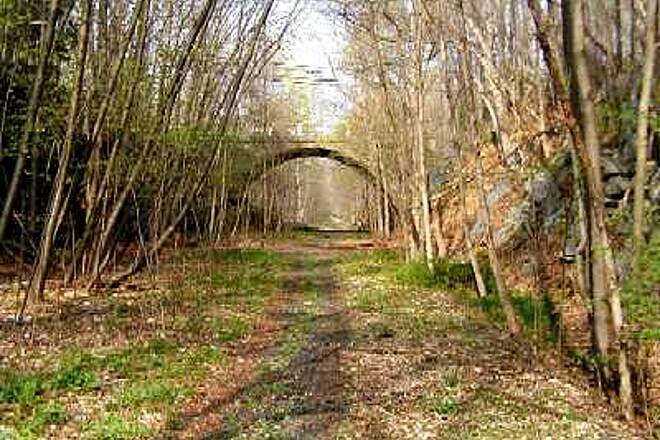 This flat, paved Hudson Valley Rail Trail stretches 5.45 miles through hardwood forests, over Black Creek and under two spectacular stone-arch bridges. 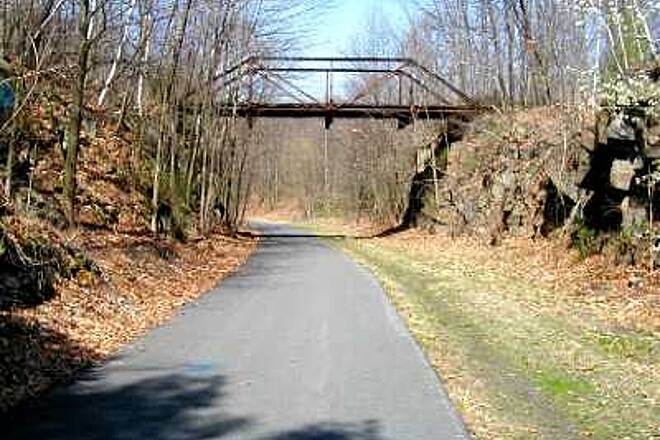 The trail connects the towns of Highland and Lloyd on the former right-of-way of the New York, New Haven and Hartford Railroad. 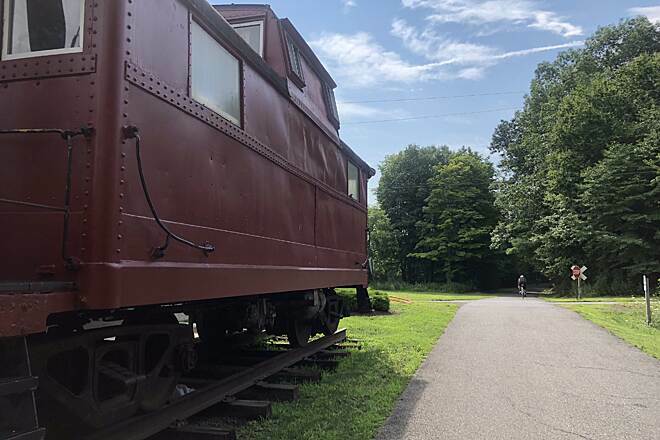 Ulster County acquired the line when the railroad went bankrupt then deeded the section from the Hudson River to Route 299 in the town of Lloyd. 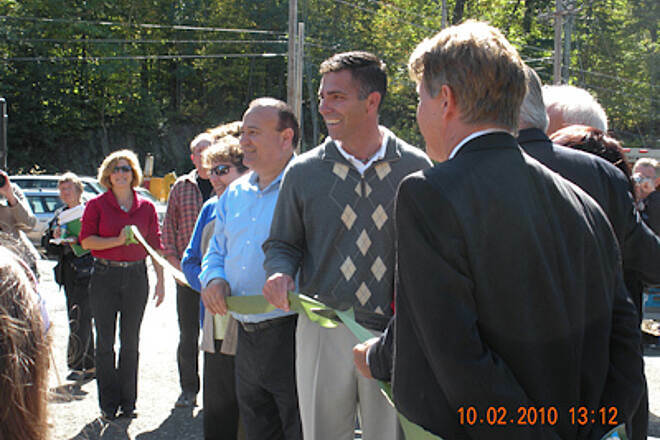 The corridor sat vacant until the town sold an easement for the installation of a fiber optic cable along the unused line. With funding in place, the citizens of Lloyd and members of the Highland Rotary Club prepared for trail development by clearing the right-of-way of brush and debris. 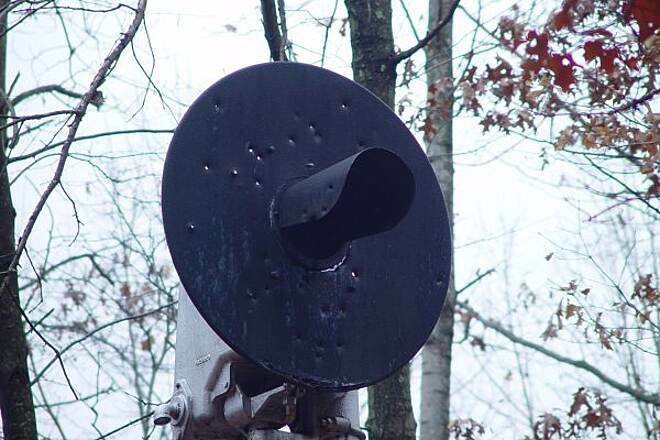 Some of the old railroad signal structures were left to provide a link to the corridor's past. 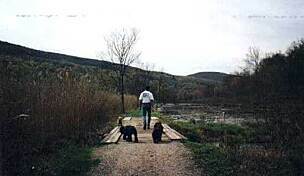 In 1997, the first section of trail was opened. From South Street in Lloyd, you'll head east, paralleling Route 299 under a wooded canopy for most of the journey. A highlight of this section is passage through Tony Williams Park, where you'll find athletic facilities, picnic tables, and restrooms. Less than a half mile from the park, the trail crosses over Black Creek, which is a popular spot with kayakers and canoeists. Farther on, the trail runs along a rock cut. In the spring, graceful columbine plants sprout out of the cracks in the rock. The cut provides a cool spot to stop and relax on hot summer days. 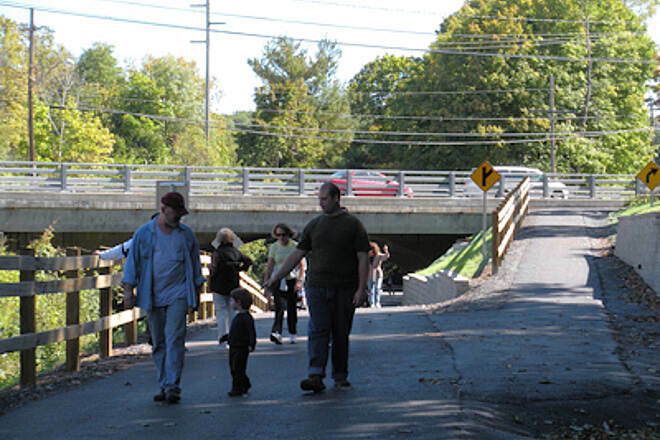 Near the trail's midpoint, two magnificent arched bridges carry New Paltz Road over the corridor. Next up is the Highland Rotary Pavilion. 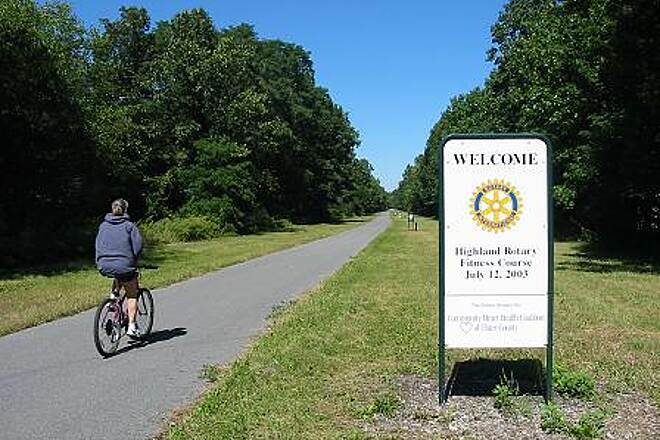 The Highland Rotary Club has made the Hudson Valley Rail Trail a primary project for more than a decade. 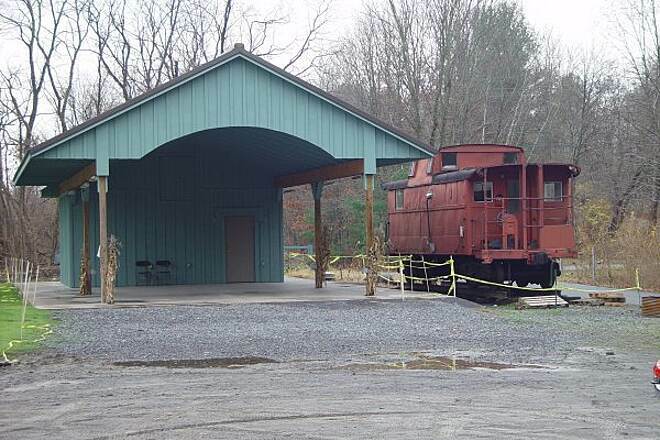 The pavilion has restrooms, a large parking lot, a fully restored caboose, picnic tables, and water. As you move east and south, trailside exercise stations let you test your endurance and strength. You are now nearing the hamlet of Highland with residential neighborhoods on a less heavily wooded trail. 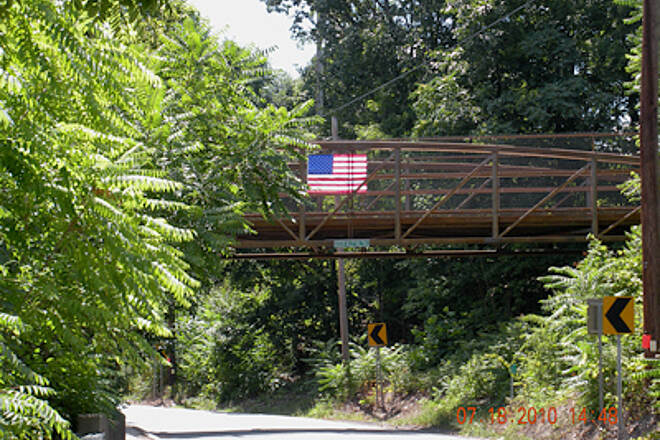 There's a pedestrian bridge over Vineyard Avenue and the trail makes its way through a greenway corridor among an urban landscape. 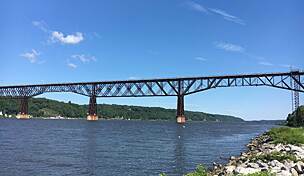 At its eastern end, the Hudson Valley Rail Trail meets up with the fantastic Walkway Over the Hudson, traversing the Poughkeepsie-Highland Railroad Bridge 212 feet above the Hudson River. 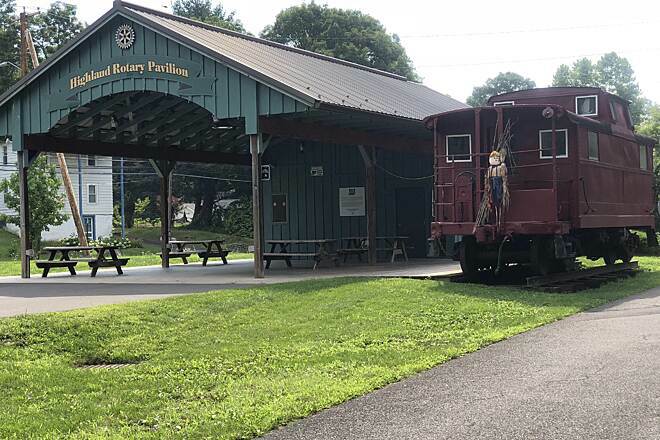 Once on the east side of the river, travelers can make a seamless connection to the Dutchess County Rail Trail to continue riding another 13 miles from Poughkeepsie to Hopewell Junction. 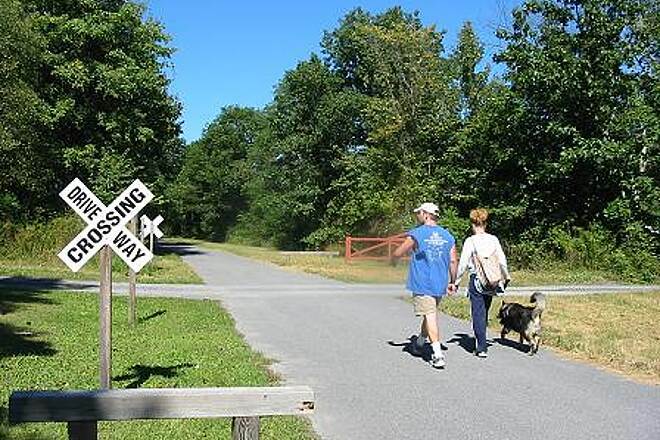 Future plans call for a connecting trail to allow travelers to continue riding farther west to New Paltz and the Wallkill Valley Rail Trail. 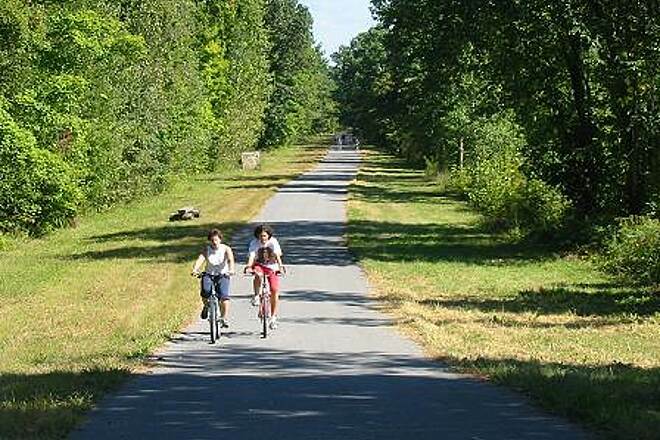 The Hudson Valley Rail Trail is also part of the Empire State Trail, a developing 750-mile trail network across New York. 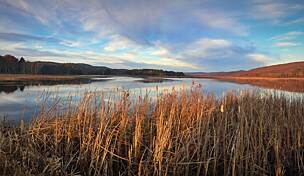 To reach the Tony Williams Park in Lloyd: From the New York State Thruway, take Exit 18 for Poughkeepsie and New Paltz. At the traffic light at the end of the exit, turn right onto State Route 299 East and go 2.3 miles. Turn right onto New Paltz Road and go 0.7 mile. Turn left onto South Riverside Road; after 0.1 mile turn right into Tony Williams Park. Parking is to the left by the start of the rail-trail. 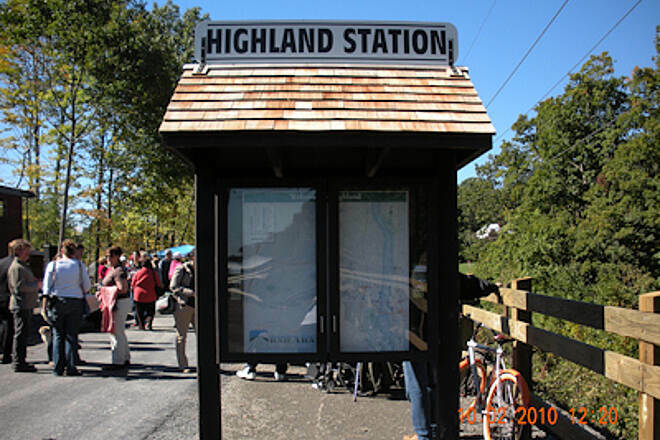 To reach the Highland Rotary Pavilion in Highland, take State Route 9W to State Route 299 West toward New Paltz. Turn left onto South Chodikee Lake Road. At the end of Chodikee Lake Road, turn right onto New Paltz Road. The parking area for the pavilion is on the left. There is also a parking area on Haviland Road at the eastern end of the trail, where it meets the Walkway Over the Hudson. Tried to post a review but censors refused to post it.Let's see if they allow this post.Ran here in early August at 6AM on a cool,humid morning.Trail well maintained.Started at Tony Williams Park.Encountered group of people walking trail who had dumbbells and appeared questionable.Same people were eyeing my car when I returned to Williams Park.This may be a very isolated incident but is there any police presence on trail.Should not have experienced this at 6AM.For the safety of other trail users,you censors need this to be posted. 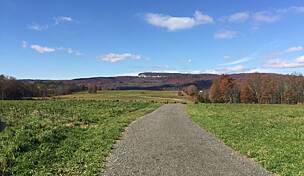 Rode this trail yesterday in conjunction with the Walkway Over the Hudson and Duchess trails. 36 mile out-and-back starting in Hopewell Junction, great riding all the way! My wife and I parked at Tony Williams Park (lots of parking space if there are no ball games going on)and rode a tandem to the Walkway. The pavement is in pretty good condition and there aren't too many pedestrians on it. It is downhill to the river, but it is a RR grade, so it's not steep at all. Views from the HVRT are of woods/forest. A very pleasant ride. When you get to the Walkway, the foot traffic really increases (we rode on a Saturday with nice weather) and we slowed to about 5 mph. We parked the car at the walkway over the hudson parking lot in Poughkeepsie and walked all the way to the end of this trail(near rt 299). Took a few hours to complete. Great and quiet walkway. A few bridges. Some pokemons. There are quite a few pokestops at near the walkway over the hudson. No rare pokemons though. This is a lovely paved level ride that opens up to the bridge over the Hudson-what a treat! Continue eastward through Poughkeepsie and ulster county. Clean, well maintained, and popular on an extremely hot summer day. Well done! This is a very nice asphalt trial that starts at Tony Williams park and connects up with Walkway over the Hudson trial. That goes across the Hudson river. Not a lot to see until Hudson river. It does go through village called Highlands but not to close to the trial. So get out and ride. After crossing over the Walkway Over The Hudson from the east side of the river, this short but quiet trail is a welcome relief. The west side of the Hudson is a little more rural than the east side. A nice stop for lunch in the hamlet of Highland is pleasant. The trail seems a little narrower but with so many less people it is not a problem. 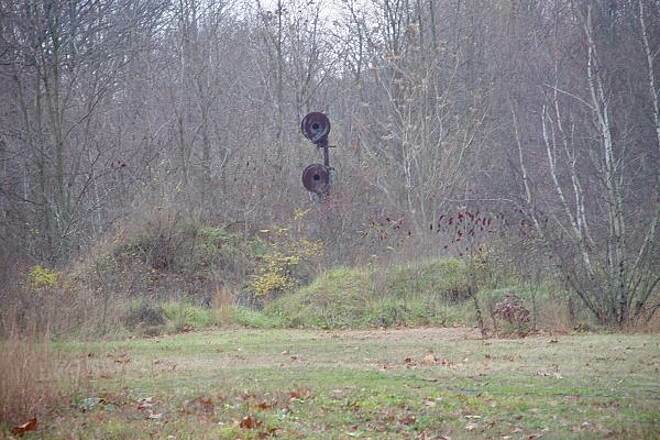 It is mostly wooded with reminders of its railroad past such as the red caboose at the Rotary Club pavillion. Right now the trail ends at Tony Williams Park. On weekends there is an open concession stand with food, rest rooms, and water fountain with plenty of tables in the shade to rest and eat. Really a wonderful trail. 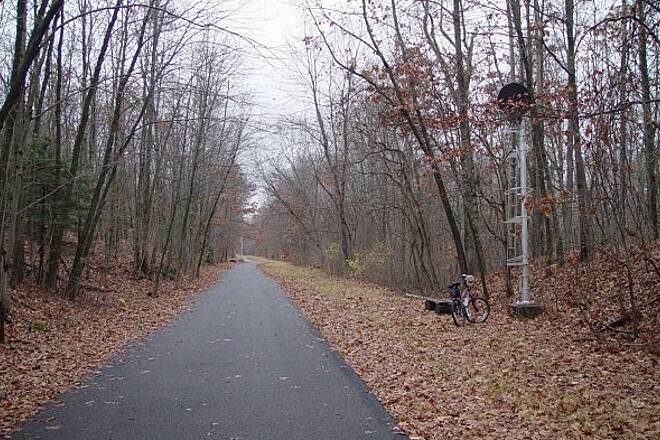 Rode the Hudson Valley Rail Trail (plus a bit) on Apr 12 2008. It's the Central New England's line from Poughkeepsie to Maybrook, although it's not ridable anywhere near that far. They've gotten money to lay a deck on the bridge and paint the bridge, so eventually the Dutchess Rail Trail and this one will be joinable ... if not joined. At the south-east end of my ride is a bridge that's out (now restored), and in Lloyd is a road bridge that was replaced by a fill without any respect for the integrity of the trail, sigh. Just one eight-foot-diameter culvert would have sufficed. I had to climb over it, enter that section from the road, back-track, and go west from there to the end of the trail. It ends up going past a trailer park, which owns the right-of-way. Eventually they'll recognize it as an amenity and let people develop it as a trail. Tons and tons of people were using the trail, even though I was riding near dusk, when the trail closes. A trail is a wonderful thing to have. There's plenty of railroadiana along this trail. There's a caboose, and several rail-served industries, and very close to Highland is a bit of track off in the weeds that used to serve a coal seller. There is a defunct road bridge that still crosses the right-of-way. There is a searchlight signal. 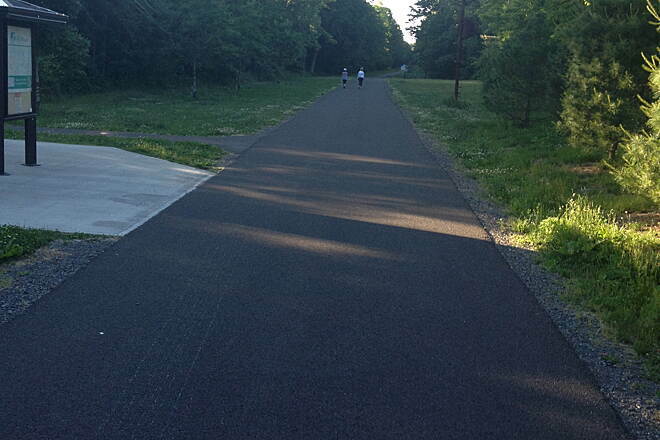 As of August, 2015 the blacktop surface was almost pristine for most of the trail. 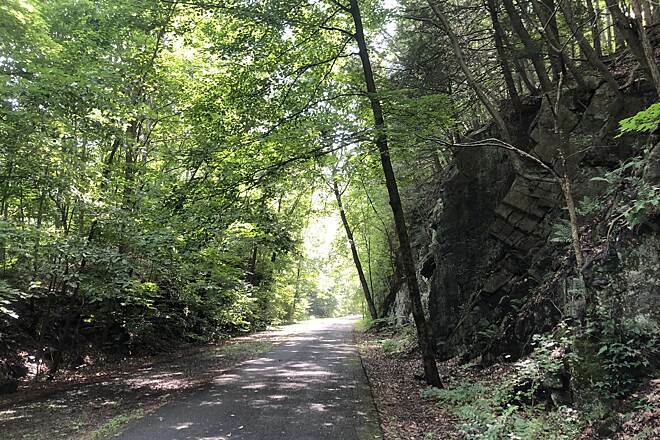 The Hudson Valley rail trail seamlessly connects with the walkway over the Hudson and the Dutchess Rail Trail giving you almost 36 miles of round trip riding. There are no major intersections to stop at and there is interesting train memorabilia by the side of the trail (cabooses, signals, etc.) 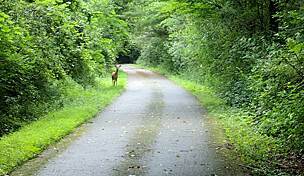 The trail is wide and passes through lush forested areas. 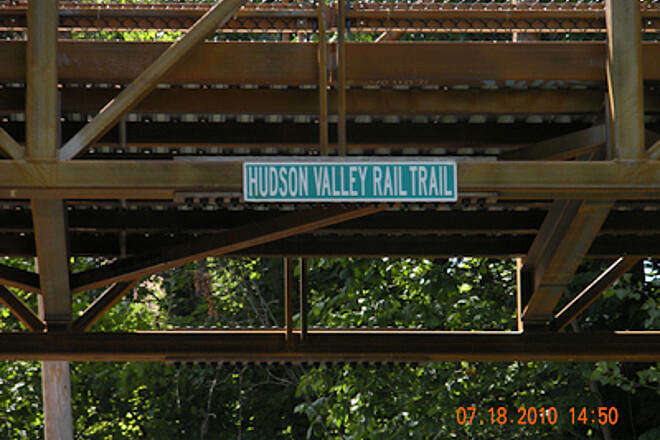 The HV Rail Trail alter going 31/2 miles from Lloyd to the Walkway Over the Hudson is now linked seamlessly to the Dutchess Rail Trail on the East side and goes 13 more miles to Hopewell Junction. This is a brand new asphalt route. This is a beautiful, well thought out and executed trail. I don't know how they did it, but 99% of this trail has a 0% grade. I live near the North County Trail in Westchester and anyone who rides it can tell you that it's *not* flat. I digress. 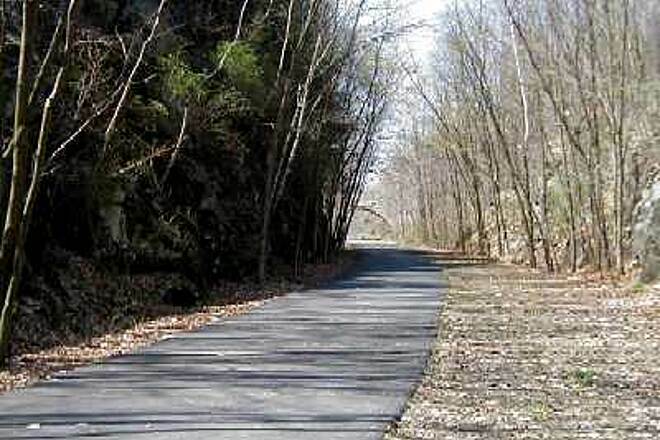 The Hudson Valley Trail is abundantly wide, well paved and also has a nice dirt/gravel path running along side the paved one for runners, walkers, etc. There is a signpost at every intersection, naming the cross streets and other pertinent information. It's a beautiful green space. It connects to the Walkway Over the Hudson, and you can tell that a lot of care went into it's planning. This is a very short but a very nice trail. I would not go out of my way to do this trail but I was in the area to do the Walk Over The Hudson and it has great parking. Mile for mile it is a nice ride. I all so did the William Stenhause trail and if you put all three together it was one great ride. Trail sections now all linked up. great ride. 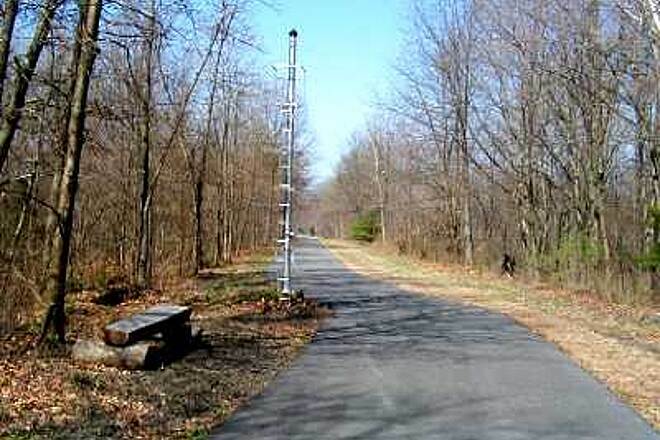 The rail trail is now continuous from Hopewell Junction, over the Hudson Walkway, and to the park 3.5mi past it. 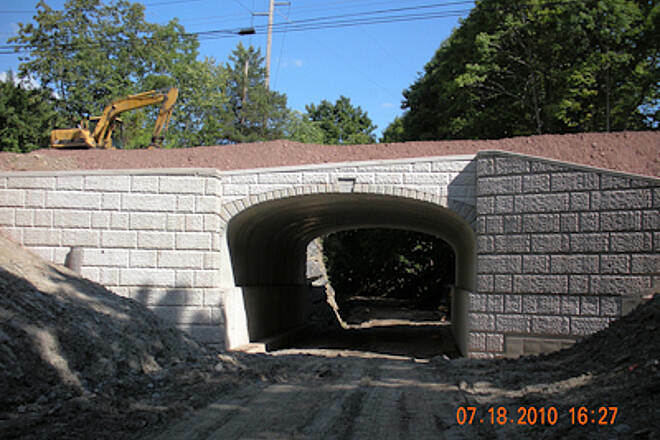 The bridge over Route 55 was a monumental task to build and looks great. Thanks to all involved in getting this section complete. We started in the parking lot on the east side of the river (free in 2012) and went west over the walkway Over the Hudson. Beautiful views and highly recommended. We didn't know at the time where the trail ended and were a little disappointed it didn't extend further west, but it was still a beautiful ride. Pathways well maintained, all paved. 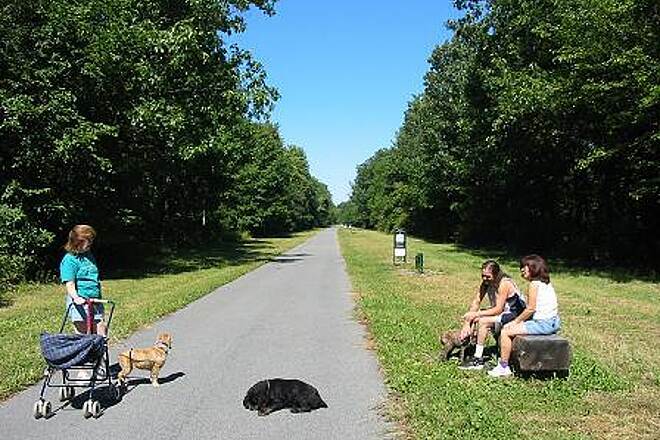 Heard the Dutchess Rail Trail now connects to the Walkway and travels south, can't wait to do that soon! 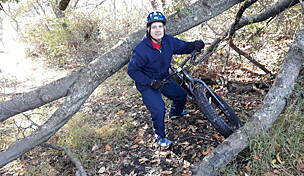 I rode the trail on Aug 21, 2012, and had a great ride. To ride the complete trail roundtrip, I would recommend parking at Tony Williams Park, at the west end of the trail, where there are plenty of spots and parking is free. 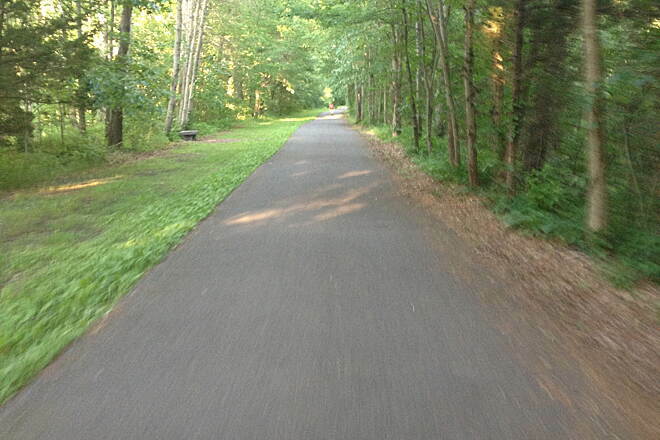 The trail is very well maintained, no trash in sight, and is completely paved. It is mostly shaded, except, obviously, where you cross over the Hudson on the old rail bridge. There are some exercise stations along part of it, although I didn't stop. Since it was a weekday, it wasn't very busy until I got to the rail bridge. Bikers here will need to go slower and watch for all the walkers. That said, the view is amazing from the bridge, and well worth slowing down for! According to the info on one of their bulletin boards along the trail, the trail will be extending west to South St in 2014. Went on my first excursion on the Walkway Over the Hudson and on to the Hudson Rail Trail. Not a long ride but very pleasant. I started on the east side, parking near Washington Street. If you can find a spot on the street it is free. If not, there are parking lots that cost $5. It was pretty easy to find off of Route 9. The bridge was beautiful and so interesting with it's historical markers and great views. It was a weekday so it wasn't too busy. The ride over the bridge is about one mile. 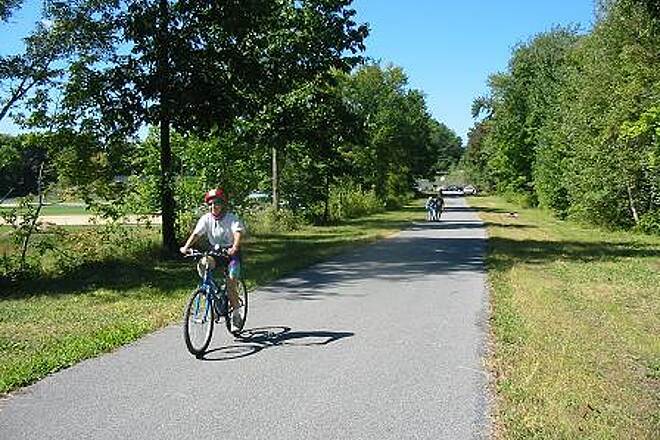 It then hooks up with the Hudson Valley Rail Trail which is paved for the approximately 3 1/2 mile ride (one way) to Tony Williams park past Highland on the west side of the river. Nice picnic tables and benches along the way and at the park. Shaded and well tended. I guess the ride totalled a little over 9 miles and was pretty easy as most rail trails are. Good for families because it's not too long. Great outing!! At US rt. 9W (0.6 mi.) there is a side trail for services along the highway. - exit the RT here and follow the detour signs for New Paltz Rd. 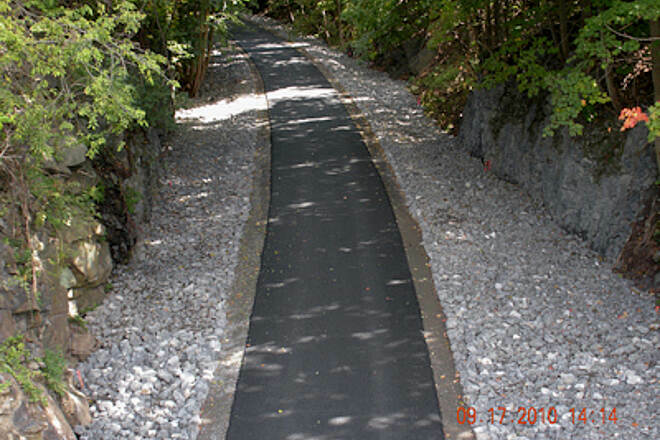 I prefer to ride on paved trails, how much of the Hudson Valley is paved? we walked this trail on 6/05/10 and found it to be a nice walk for a decent day. 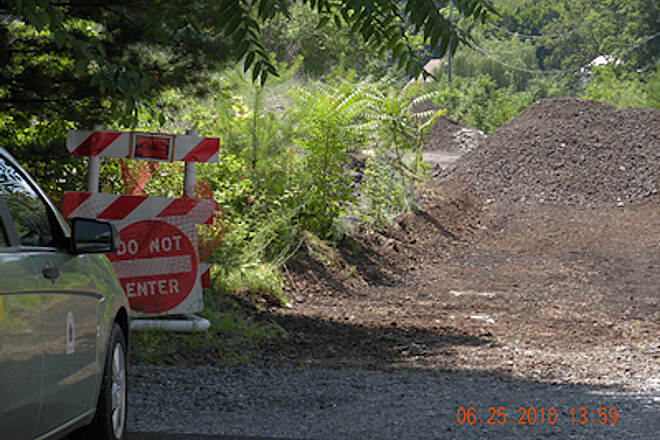 Construction on New Paltz Rd bridge had the Rail Trail blocked (which many had circumvented and would not at all be recommended when work is ongoing... which makes me think why would any moron do that and not make any considerations for folks that are using the trailin the first place?.... )and the tunnel(s) removed where there once may have been adventure.. at the eastern treminus the trail turns to gravel.. and bridge abutments are under construction for a new bridge for the rail-trail over a roadway below... this will help further connect the trail to the most awesome rail trail bridge over the Hudson and into Pughkeepsie NY which is very close , very cropwded , and still which I would highly recommend. We rode this trail April 22,2010 and started at the Williams Park end.We went about 1.5 miles and had to stop due to road work on a road bridge on County Rte 15 which crosses the trail.The trail was completely covered with a huge pile of broken concrete and blocked off.It looks like it will be this way for some time.We then drove around the construction and tried again closer to the village of Highland.,where there is a small pavilion and an old caboose.There is work ongoing now toward the east end of the trail and a bridge is being built over Vineyard Ave(Rte 44).They still have about a mile to develop until the trail connects with the new Walkway Over the Hudson(old RR bridge).I would guess the work will continue most of this year at best until this connection is completed.The trail part that we were on is very well paved,wide,and in good shape. 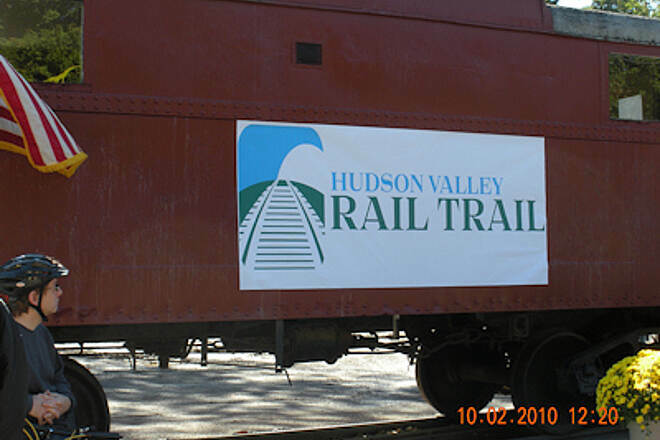 I qm new to the trqil to rqil qnd the Hudson Valley Rail-Trail. informatiom about biking in the area. what i did see it was very beautiful. 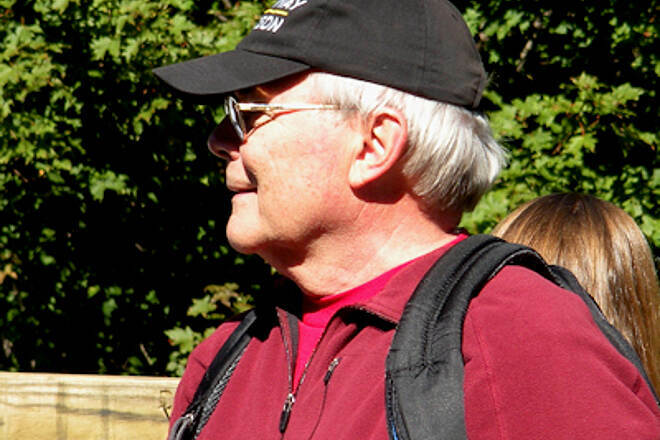 "I took 3 Cub Scouts on the trail early September 2007. Nice trail, wide with great rock outcroppings and interesting leftover RR relics. The nature area was a nice place to take a rest and look around. Too short though, we rode it 4 times just to get a decent ride in. The kids loved the Caboose. 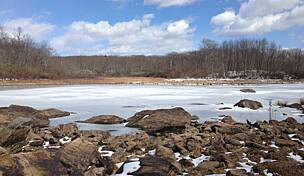 If ever extended to the river near the bridge it would be a great trail." "We rode the trail on a dreary day in November. The entire trail is 2.6 miles long with 2.4 of those miles paved and the remaining rideable on a hybrid bike. The trail starts at Tony Williams Park (N41.73655 W74.00131 approximatley 372' ASL) and heads east. Along the trail there are a pair of old railroad signal stands, one with a signal still on it. Downhill on either side of the trail can be seen the old alignment of this rail line. Farther along is what appears to be the main parking area on New Paltz Rd. 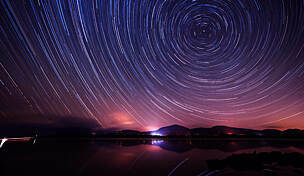 (N41.73405 W73.97502 332'). 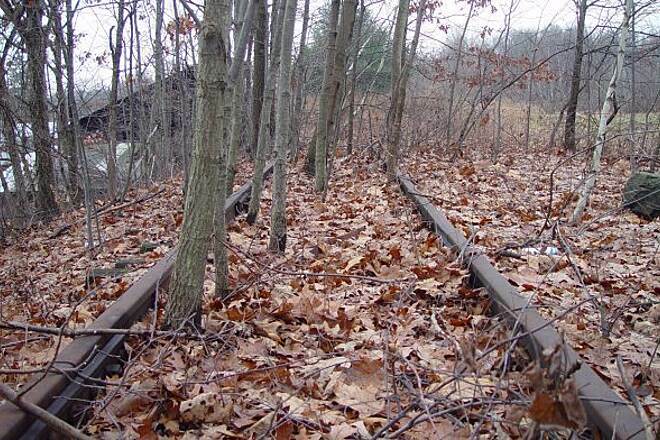 Right near this parking area is an abandoned rail car. This car can be seen from New Paltz Rd. but not from the trail. At this point the trail turns south and continues to the ""Fitness Trail"" portion before the paved trail ended at N41.72052 W73.96917 306'. The Fitness Trail portion has a very wide grass shoulder adjacent to the paved trail and places where people younger and sknnier than me can exercise on simple equipment and benches. The unpaved trail continues south and ends at Vinyard Avenue (N41.71744 W73.96830 298') where there used to be a bridge over the road. 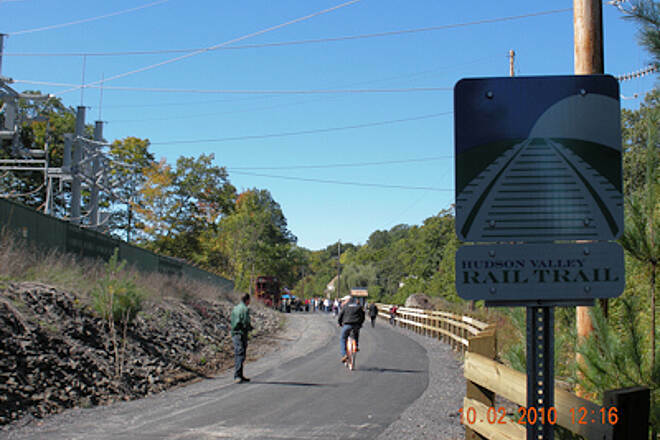 According to http://www.midhudsonnews.com/News/TLyd_railtrail-08Nov06.html the trail will be extended east in the future. http://www.hvnet.com/features/highlandrailtrail.htm shows a parking area at this end but we didn't see it, probably because we were'nt looking for it. Next time we'll search it out, that way the return trip will be downhill all the way." "It was a nice path, but I agree with a previous reviewer - I used to prefer paved trails but now I find I like unpaved a lot better. Especially in the heat of summer, when the paved surfaces reflect so much heat. I thought the fitness circuit alongside the trail was neat, too. My husband and I tried to continue the trail behind Vintage Village and found that someone had roped it off, so that was a disappointment." "Beautiful, but why is it paved?" 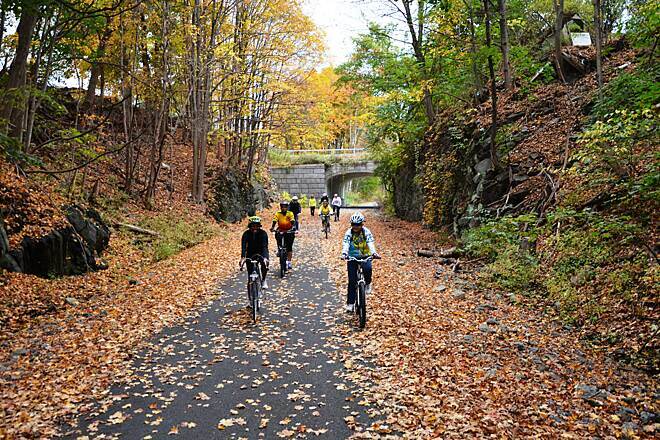 "The Hudson Valley Rail-Trail is a beautiful trail, but why is it paved with asphalt? The only users of this type of trail may be baby carriages and rollerbladers. Mountain bikers, runners, and horseback riders all prefer a softer surface. What's the point in paving this trail? I think this is less like a trail and more like a long sidewalk. It's a shame this trail was paved." 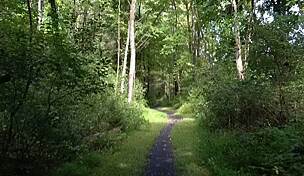 " This trail runs from Riverside Ave in Tony Williams Park in Lloyd Township east and south for almost 2.5 miles. It follows the double-tracked (and sometimes triple-tracked) ROW with one width being paved and the other width left as a natural path. 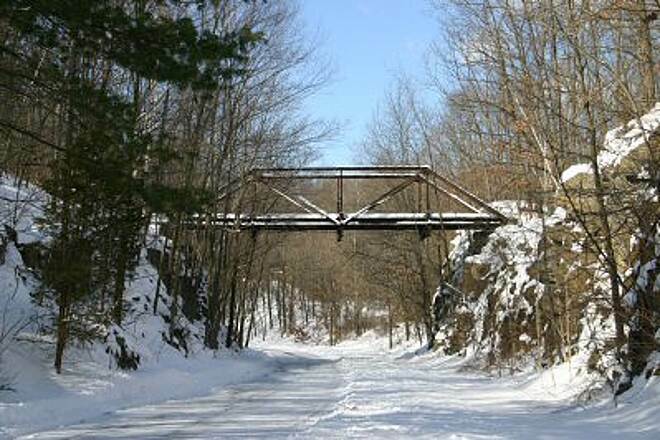 This makes the trail equally useful for hiking, biking, in-line skating, and horseback-riding. There are a number of benches along the route and many railroad artifacts dot the route. At the eastern end, there is about 1/4 mile of unpaved trail, with a generally good surface. West of Tony Williams Park, the ROW (as a single-track now) is clear but unimproved for about a mile. This section is better for walking, as there are occasional bits of debris on the trail. If these two end sections were paved, a nice short trail could become a nicer, longer trail. Since this trail is rather wide, shade is hard to come by around midday. 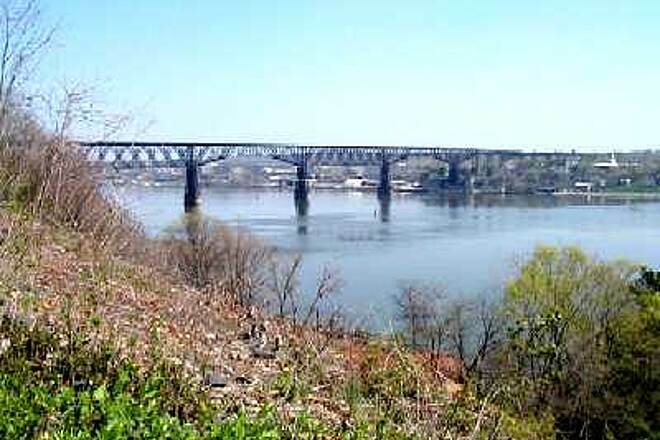 The section between the eastern effective end at Rte 44/55 in Highland is unusable to the Mid Hudson RR Bridge. It is full of standing water, trash, and, for the most part, is quite overgrown. Since the bridge is closed for the forseeable future due to litigation, this section currently serves no useful purpose anyway. Rates a 7 out of 10! "It took me quite a while to find this trail based upon driving directions posted on a local web site, but it was worth the effort once I got there. 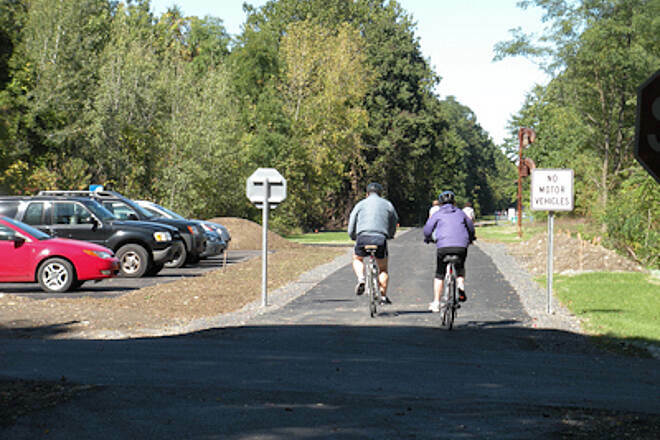 Only 2.5 miles of the 5 mile trail is paved and accessible to cyclists. The remaining 2.5 miles is overgrown in spots and its surface is mostly covered with large gravel. Even mountain bikers with dual suspension bikes will be in for harsh rides. Certainly hikers might find the unpaved segments enjoyable. There are no street crossings on the paved section. This is wonderful for families with small children. The pavement is in perfect condition also. In line skaters will love this. Beautiful mountain vistas abound for trail users. The town park at the western terminus of the paved segment offers plenty of free parking and some covered picnic benches as well. 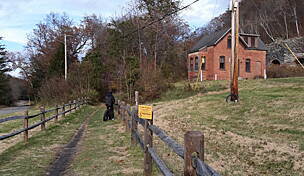 Rail fans will delight at the many artifacts left behind from the old railroad that used this right-of-way. Best access is via Route 299 and then south on Riverside Avenue to the park (signs clearly indicate the rail trail access point). In summary, the trail is short but well constructed and in a very scenic area. 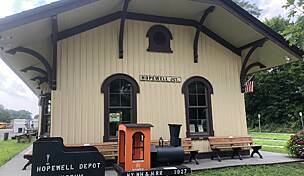 Well worth the trip for those nearby or if you're far away combine it with a trip to the Wallkill Valley Rail Trail. "